Halosim (fluoxymesterone) is a testosterone derived steroid and it is 19x more anabolic as testosterone and 8.5x more androgenic. 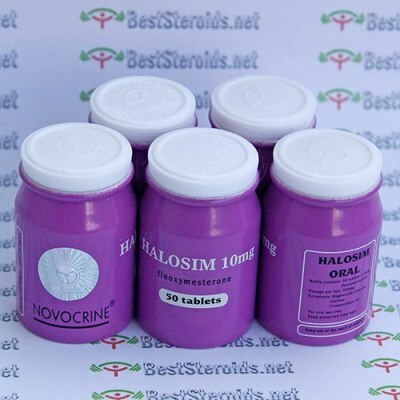 Halotestin has a volumizing effect on the physique, and for those with low a body fat percentage, this will cause an immediately more contest ready appearance. It exerts its effects on strength and fat loss by both regulation of fatty acid oxidation in the liver and fast-twitch muscle mitochondria. Halosim (halotestin) is especially useful on a cutting or strength cycle and less for mass and weight gains. Besides bodybuilders, since promote aggression and gives you noticeable strenght gains, can be a great drug for athlets as well for Powerlifting, Rugby, Mixed Martial Arts and so on. Stuff is fire but expensive. Awesome for cutting, within a week my stomach and pects were visible tighter. Also increased strength while workout. The gain proved to be solid so I must say I am quite pleased. Great and hard to find product!! I know many people say take at least 20mg a day. I take only 10mg and I get great intensity without the side effects. Great 45 min to an hour before workout. Best use as a kick start a cycle or solidify gains at the end of one.